1. Wash the dragon fruit. Cut into quarters, peel the skin. In a bowl, mash the dragon fruit until smooth, add 1 tbsp. honey. Chill. Set aside. 2. In a medium pot, blanch carrots, asparagus and bell pepper. Drain water, immediately place in a bowl and toss with a small small amount of olive oil. Spread out to cool. 3. In a bowl,season shrimps with salt and pepper. Then melt butter in a frying pan over medium heat. Add 1 tsp. 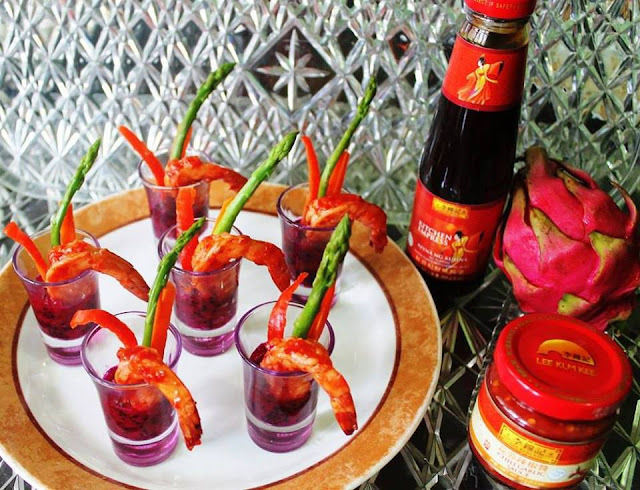 Lee Kum Kee Kitchen Empress All Purpose Oyster Flavoured Cooking Sauce and 3 Tbsp. Lee Kum Kee Chili Garlic Sauce and Shrimps. Stir-fry shrimps until opaque. 4. To serve. Spoon puree into the shot glasses. Hook shrimps onto rims. Then, insert sticks of asparagus, carrot and bell pepper. Serve immediately.